Rumors of “cheap speed” prescriptions and speculation about cocaine use notwithstanding, celebrity real estate developer and Republican presidential candidate Donald Trump enjoys a decades-old reputation as a teetotaler. That did not, however, stop him from employing a convicted cocaine trafficker in the 1980s. Weichselbaum was sentenced to three years in prison and served just 18 months before receiving early release, while the others charged in the same indictment got as many as 20 years. After Weichselbaum was released, he moved into Trump Tower with his girlfriend, who had just bought two adjoining apartments there for $2.4 million. According to investigative reporter David Cay Johnston, the payment was made in cash, leaving no public record of where the money came from or if anything even changed hands. (Weichselbaum and his upstairs neighbor were very close: He told his probation officer about Trump’s affair with Marla Maples long before the tabloids found out, the Smoking Gun reports.) 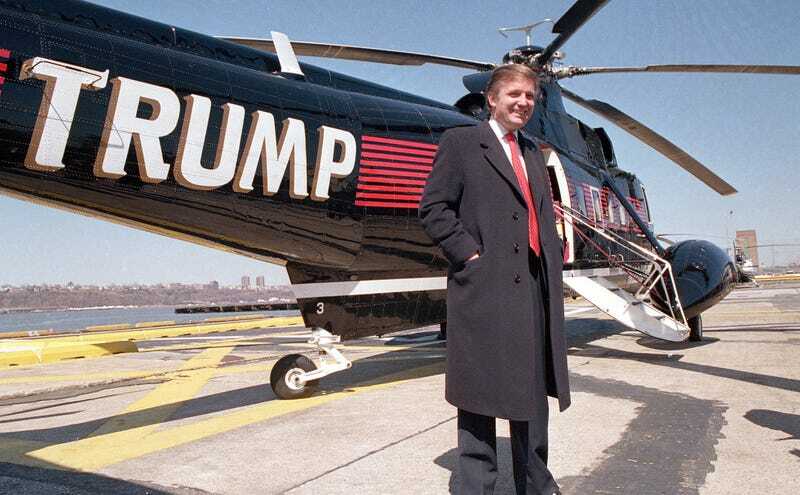 And Trump didn’t just put Weichselbaum up after he got out of prison: He also continued paying the helicopter company—which had declared bankruptcy twice—$180,000 a month, despite having purchased three helicopters of his own, to form Trump Air. “Trump has never been known to use drugs or even drink,” Johnston recalled earlier this year. “What motivated him to risk his valuable license by standing up for a drug trafficker remains unclear to this day.” Spy had a theory: Trump was paying Weichselbaum not just for his helicopter services but for his connections to the drug world, which provided access to the kinds of amenities not listed in brochures, which a certain class of clientele would expect to be supplied at no additional charge.